"For a great selection of wrenches at unparalleled value, this set is a must-have." "It’s a big win for a hobbyist on a budget." "These wrenches share the same surface drive technology as their lower-end counterparts, and possess reversible ratcheting capabilities." "Flare nut wrenches engage more corners of a fastener—they have a wider contact area." "Every wrench you need for working in hard-to-reach places that you just can’t seem to access with your trusty socket wrench." "Satisfied customers all seem to agree that this is one high-quality set with a price tag that can’t be beat." Balance is key to a dependable tool, and, if you’re in the market for a wrench set that combines functionality, affordability, and variety, then GearWrench’s 20-Piece Ratcheting Wrench Set is sure to be a welcome addition to your tool belt. With a whopping total of 20 sizes, 10 metric and 10 SAE, these double-sided wrenches—which boast both open and box ends—have got you covered. The wrenches you’ll find in this patented set range from 1/4” to 3/4" (SAE), and from 6mm to 18mm (metric). Ideal for both professional automotive mechanics and amateur tool shed tinkerers, GearWrench’s products are known for their unparalleled strength—in fact, they meet or exceed a variety of torque specifications. And according to satisfied customers, these wrenches can really take a beating, meaning you’ll never have to worry about being a little too rough with them. Not only are they durable, but they boast slim head shanks that allow easy access to even the tightest spaces. Satisfied buyers swear by the GearWrench 20-Piece Ratcheting Wrench Set. For a great selection of wrenches at unparalleled value, this set is a must-have for both the professional who uses his tools every day and the aspiring home handyman. If your career doesn’t require you to have the most cutting-edge tools around—or if you primarily use your tools for more minor projects—there’s nothing wrong with opting for a more affordable alternative to a higher-end set of wrenches like the 10-piece Crescent CCWS2 SAE Combination Wrench Set. This set contains ten SAE-sized, mirror polish-finished wrenches—ranging from 1/4” to 3/4”—that are perfect for a variety of smaller jobs, whether you’re a hobbyist or a seasoned pro. It’s a big win for a hobbyist on a budget, but that doesn’t mean this set of heat-treated chrome vanadium alloy steel wrenches sacrifices quality to keep your wallet heavy. Crescent’s wrenches—specifically, their box ends—utilize surface drive technology to eliminate the wearing down, or “rounding,” of fasteners. Resistant to both abrasion and corrosion, these wrenches are a great buy, whether you intend to use them as backups or as your primary tools. Buyers even report them to be on par with many higher end sets. If anything, this set seems considerably underpriced—and that’s a good thing. Whether they’re fresh out of an apprenticeship or ready for retirement, no mechanic can resist a brand new set of GearWrench ratcheting wrenches. Not only do these professional grade wrenches share the same surface drive technology as their lower-end counterparts, but they possess reversible ratcheting capabilities, 15-degree offset on their box ends—key for protecting users’ knuckles from harm—and a gorgeous polished chrome finish. The wrenches you’ll find in this set range from 8mm to 25mm. GearWrench’s 16-piece set—which comes with a free storage caddy—is a perfect first wrench set for entry-level technicians or amateur automotive aficionados. Working on older cars or imports means that bigger ratcheting wrenches—like GearWrench’s 24mm and 25mm pieces—are an absolute must. If you’re in the automotive repair business, consider the Craftsman 9 Piece Standard and Metric Flare Nut Wrench Set your next go-to tool kit. Flare nut wrenches engage more corners of a fastener—they have a wider contact area—making them the ideal tool for removing and replacing nuts on fuel lines, brake lines, and other automotive parts that are prone to rounding and deforming. 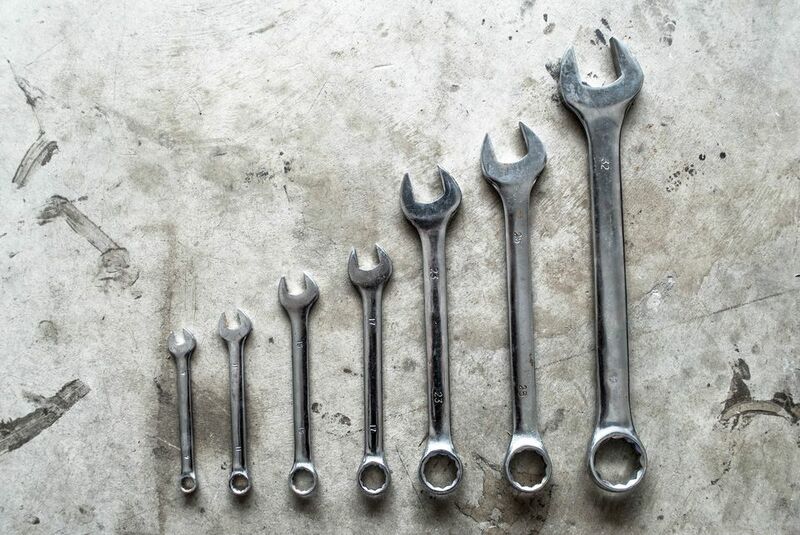 These steel alloy wrenches come in four of the most common SAE sizes and five of the most common metric sizes, ranging from 3/8” x 7/16” to 3/4” x 7/8”, and 9mm x 11mm to 19mm x 21mm. Many satisfied buyers report putting these wrenches to good use on softer metals and worn-out nuts—materials that would otherwise slip through a wrench with less grip. Aesthetically, these tools are pleasing to the eye; they come in a beautiful polished silver that is sure to make you the envy of the guys at the garage. Craftsman is a brand you can trust—and their products, which are all backed by the “Craftsman Forever Warranty,” are proof of their commitment to customer satisfaction. Backyard mechanics and automotive professionals can rest easy knowing that the GearWrench 9312 SAE Master Ratcheting Wrench Set makes working in tight, restrictive areas—like the engine of your beloved ‘74 Lamborghini—a breeze. This set of 13 polished silver wrenches range in size from 5/16” to 1 ¼”. They also boast GearWrench’s patented surface drive technology on the box end of each wrench for optimum grip—and to prevent rounding, which could make it impossible to remove nuts in the future. GearWrench combines the speed of a ratchet with the ease of a standard wrench—that’s why their wrenches boast 5-degree ratchet control and take less work to finish every job. When you’re done for the day, organizing your wrenches is easy thanks to the molded wrench rack that comes free with your purchase of this set. Whether you’re restoring a classic car or performing routine work on your priceless ride, this set courtesy of GearWrench has every wrench you need for working in hard-to-reach places that you just can’t seem to access with your trusty socket wrench. Sunex puts automotive professionals first, arming them with the tools they need for the trade. Crafted from only the finest grade alloy steel, the wrenches you’ll find in the Stubby Combination Wrench Set combine an open end wrench with a box end wrench to result in one excellent tool. Not only are these wrenches tough and durable, but their size and shape are perfect for working in cramped spaces—like under your car’s hood—meaning you spend less time working on your car and more time driving it. Sunex’s set includes wrenches ranging from 3/8" to 1"in size. Sunex’s tools are just the right size, fit, and finish for a variety of jobs. When it’s time to clean up, just slip your new favorite wrenches into their complimentary heavy-duty canvas pouch and roll them up for easy and safe storage. Mechanics love these little stubby wrenches—in fact, Sunex’s satisfied customers all seem to agree that this is one high-quality set with a price tag that can’t be beat. Offset wrenches are unique in that they’re bent on either end to accommodate for tight squeezes and awkward nut and bolt placement. Due to their odd shape, these wrenches serve extremely specific functions—but that doesn’t mean it’s not important to have them on hand in case a situation arises when they’re needed. WORKPRO’s Box End Wrench Set is an excellent set to keep in your trunk or tool shed on the off-chance you’ll need one. This set includes wrenches ranging from 6mm x 7mm to 20mm x 22mm. These offset wrenches are made of heat-treated vanadium steel—in other words, they’re as nifty to look at as they are tough, so don’t let their slender forms fool you. The elements don’t stand a chance against them, as these wrenches are coated with a rust-resistant chrome-plated finish. Finally, a free storage rack rounds off this affordable set of offset wrenches. If you’re in the automotive repair business, chances are you’re going to run into a problem that an old-fashioned wrench just can’t handle. That may very well be when Sunex’s offset wrenches come in handy.